Two Australian Museum Eureka Prizes have been awarded to University of Queensland researchers for their outstanding discoveries in the fields of health and physics. The top awards for science were presented to UQ’s Optical Physics in Neuroscience team and the cross-institutional CF Air team for their respective work in devising cutting-edge methods for studying how our brains detect gravity and motion, and for uncovering how bacterial pathogens are transferred between cystic fibrosis (CF) patients. UQ School of Biomedical Sciences researcher Associate Professor Ethan Scott is part of the Optical Physics in Neuroscience team which took out the 2018 UNSW Eureka Prize for Excellence in Interdisciplinary Scientific Research. He said he believed their research would lead to a much better understanding of how movement affects the brain. “We're interested in how the brain processes movement, but it's difficult to study activity in a moving brain,” he said. “In our interdisciplinary project, using the physics technique of optical trapping, we've used a laser to move the ear stones in zebrafish model, producing a sensation of movement and eliciting behavioural adjustments, all without moving the animal. 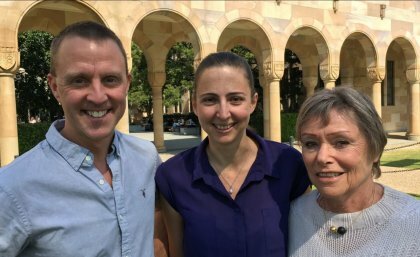 UQ’s Optical Physics in Neuroscience team members are Associate Professor Ethan Scott (School of Biomedical Sciences), Professor Halina Rubinsztein-Dunlop and Dr Itia Favre-Bulle (both from UQ’s School of Mathematics and Physics). CF Air team’s UQ members are Dr Luke Knibbs (School of Public Health), Dr Tim Kidd (School of Chemistry and Molecular Biosciences) and Professor Claire Wainwright (Child Health Research Centre). Image above: CF Air team - UQ's Dr Tim Kidd (second from the left), Dr Luke Knibbs (third from the right), Professor Claire Wainwright (far right). Media: Associate Professor Ethan Scott, ethan.scott@uq.edu.au, +61 432 798 207; Dominic Jarvis, dominic.jarvis@uq.edu.au, +61 413 334 924.